Astronomers at Arizona State University have found an exceptionally distant galaxy, ranked among the top 10 most distant objects currently known in space. Light from the recently detected galaxy left the object about 800 million years after the beginning of the universe, when the universe was in its infancy. 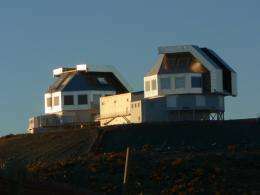 A team of astronomers, led by James Rhoads, Sangeeta Malhotra, and Pascale Hibon of the School of Earth and Space Exploration at ASU, identified the remote galaxy after scanning a moon-sized patch of sky with the IMACS instrument on the Magellan Telescopes at the Carnegie Institution's Las Campanas Observatory in Chile. The observational data reveal a faint infant galaxy, located 13 billion light-years away. "This galaxy is being observed at a young age. We are seeing it as it was in the very distant past, when the universe was a mere 800 million years old," says Rhoads, an associate professor in the school. "This image is like a baby picture of this galaxy, taken when the universe was only 5 percent of its current age. Studying these very early galaxies is important because it helps us understand how galaxies form and grow." The galaxy, designated LAEJ095950.99+021219.1, was first spotted in summer 2011. The find is a rare example of a galaxy from that early epoch, and will help astronomers make progress in understanding the process of galaxy formation. 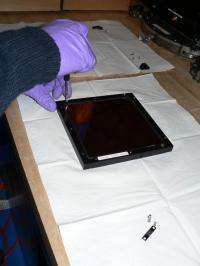 The find was enabled by the combination of the Magellan telescopes' tremendous light gathering capability and exquisite image quality, thanks to the mirrors built in Arizona's Steward Observatory; and by the unique ability of the IMACS instrument to obtain either images or spectra across a very wide field of view. The research, published in the June 1 issue of The Astrophysical Journal Letters, was supported by the National Science Foundation (NSF). This galaxy, like the others that Malhotra, Rhoads, and their team seek, is extremely faint and was detected by the light emitted by ionized hydrogen. The object was first identified as a candidate early-universe galaxy in a paper led by team member and former ASU postdoctoral researcher Hibon. The search employed a unique technique they pioneered that uses special narrow-band filters that allow a small wavelength range of light through. A special filter fitted to the telescope camera was designed to catch light of narrow wavelength ranges, allowing the astronomers to conduct a very sensitive search in the infrared wavelength range. "We have been using this technique since 1998 and pushing it to ever-greater distances and sensitivities in our search for the first galaxies at the edge of the universe," says Malhotra, an associate professor in the school. "Young galaxies must be observed at infrared wavelengths and this is not easy to do using ground-based telescopes, since the Earth's atmosphere itself glows and large detectors are hard to make." To be able to detect these very distant objects which were forming near the beginning of the universe, astronomers look for sources which have very high redshifts. Astronomers refer to an object's distance by a number called its "redshift," which relates to how much its light has stretched to longer, redder wavelengths due to the expansion of the universe. Objects with larger redshifts are farther away and are seen further back in time. LAEJ095950.99+021219.1 has a redshift of 7. Only a handful of galaxies have confirmed redshifts greater than 7, and none of the others is as faint as LAEJ095950.99+021219.1. "We have used this search to find hundreds of objects at somewhat smaller distances. We have found several hundred galaxies at redshift 4.5, several at redshift 6.5, and now at redshift 7 we have found one," explains Rhoads. "We've pushed the experiment's design to a redshift of 7  it's the most distant we can do with well-established, mature technology, and it's about the most distant where people have been finding objects successfully up to now." Malhotra adds, "With this search, we've not only found one of the furthest galaxies known, but also the faintest confirmed at that distance. Up to now, the redshift 7 galaxies we know about are literally the top one percent of galaxies. What we're doing here is to start examining some of the fainter ones  thing that may better represent the other 99 percent." Resolving the details of objects that are far away is challenging, which is why images of distant young galaxies such as this one appear small, faint, and blurry. "As time goes by, these small blobs which are forming stars, they'll dance around each other, merge with each other and form bigger and bigger galaxies. Somewhere halfway through the age of the universe they start looking like the galaxies we see today  and not before. Why, how, when, where that happens is a fairly active area of research," explains Malhotra. In addition to Hibon, Malhotra, and Rhoads, the paper's authors include Michael Cooper of the University of California at Irvine, and Benjamin Weiner of the University of Arizona. 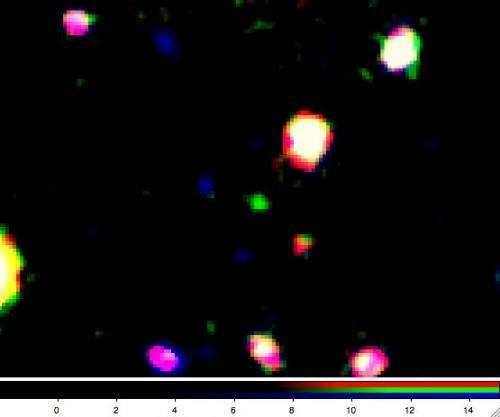 "The find is a rare example of a galaxy from that early epoch, and will help astronomers make progress in understanding the process of galaxy formation. " Because they clearly do not understand. ^ Thanks, Captain Obvious. That's the whole point of science, to gain understanding of things not yet understood. Ooh snap. I think we should stop trying to reasonably explain the scientific method to religious nuts/trolls and resort to ridicule. Hitchens always maintained that ridicule is a very powerful weapon. Voted you 5 stars, good sir. There is a cult of ignorance in the United States, and there has always been. The strain of anti-intellectualism has been a constant thread winding its way through our political and cultural life, nurtured by the false notion that democracy means that "my ignorance is just as good as your knowledge." Thanks a lot for the quote. I looked up and read a web page of Asimov's quotes after reading the one you posted. Asimov is a man of well-spoken observations. I would be interested to hear your Ahem!!! Views.....? After Michelson and Morley's interferometer experiment and the dismissal of the "luminiferous aether" due to zero results after thousands of trials, its exsistence has been proven in vortexial-flow experiments - there has been a resurgence in the scientific acceptance of a "pseudo-fluid ether" - see Stan Deyo's analyses. Galaxy formation is better understood this way and completely does away with angular momenta controversies "solved" by a "dark matter" and "dark energy" which themselves are completely lacking in understanding. In these analyses gravity is axiomatically accepted to be a "two-component" force. We are also beginning to understand that gravity has both longitudinal and scalar components. Since this post, I have not found any clear countervailing news. For example, now Fermi bubbles confirm that our galactic core is not always quiescent. This after mainstreamers have been proclaiming the opposite for decades. Why? There are many other examples that support LaViolette's continuous creation model. Think different. "As time goes by, these small blobs which are forming stars, they'll dance around each other, merge with each other and form bigger and bigger galaxies. Somewhere halfway through the age of the universe they start looking like the galaxies we see today and not before. This then would appear to be the mainstream dogma. If it isn't like this then they are surprised - as they have been for the past couple of years already. Galaxies keep popping up fully formed and very mature when no one expected them to be. But do they then apply true scientific reasoning to explain the difference between the [above dogmatic] expectation and the actual observation? NO. Some ad-hoc assumption is conjured from nowhere to bring observation in line with the dogmatic expectation.I've contended a long time now that people should stop making inferences about the origins of things and simply build models around the actual observations. There just is no way at the moment that to verify historical items.